I’ve always admired minimalism. Becker defines it as “a lifestyle where people intentionally seek to live with only the things they really need.” The idea being that if one strips away all that isn’t important to them what they are left with will represent what they value most. This philosophy appeals to me more as my children age and become consumers themselves. Becker explains, “Living with less provides more time to spend on meaningful activities and more freedom to travel and move about.” And I couldn’t help but feel like I wasn’t modeling this behavior well enough for them to follow my lead. Implement habits to manage your clutter. Slow the accumulation of possessions. A classic mistake parents make is tackling their kids’ stuff first. Becker believes parents need to begin by organizing their own stuff. So much of what clutters one’s home are items that are no longer in use so if you begin there and choose purchases carefully moving forward you can do a lot in terms of changing your surroundings. Becker also offers plenty of practical strategies once children are ready to tackle their toys. For example, Becker suggests parents “set a confined, physical space for toys.” Once that shelf or closet is full, children will need to make decisions before they can add new toys at birthdays and holidays. I’m particularly intrigued by Becker’s success with Project 333 – a program designed to help people rethink their wardrobes. With two daughters, managing hand-me-downs has become an issue. My younger daughter often piles her favorite clean clothes in front of her dresser and selects outfits from there, leaving everything in the dresser (and the closet) untouched. In keeping with Becker’s parents must model the behavior first, I’m going to accept the challenge the 3-month experiment presents: “Wear only 33 articles of clothing for 3 months. All clothing accessories, jewelry, outerwear and shoes count towards your number – exceptions include wedding ring, underwear, sleep wear, in-home lounge wear, and workout clothing.” While it sounds a bit extreme, my closet could use a clean out. I’ve still got clothes I wore in college twenty plus years ago. According to Becker, “Limiting your wardrobe does not rob you of personal style – it causes you to find it.” Perhaps, if I discover new habits, my kids will too. Becker recognizes choosing to live with less is difficult in our material society, but he believes if we stop comparing our lives and simply start living them joy will find us. 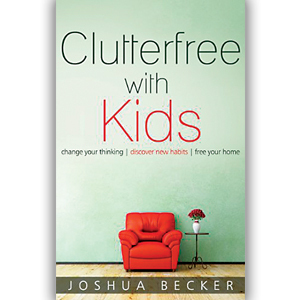 So whether you’re tired of the clutter in your closet, your family room, or your car, check out Clutterfree with Kids by Joshua Becker for a fresh approach to overcoming clutter. 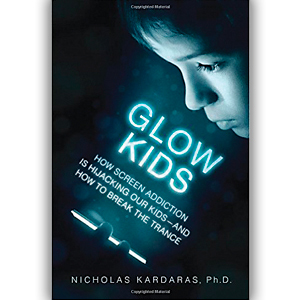 In Glow Kids by Dr. Nicholas Kardaras, he builds the persuasive case that screen addiction is hijacking our kids and that parents need to break the trance. Citing a plethora of studies correlating technology with disorders like ADHD, depression, and aggression, Kardaras establishes the profound consequences of screens on children’s brains. While the book focuses heavily on the negative impact of video games, it also offers substantial research on the damaging effects of social media and the problems with educational reforms that rely on technology. Dr. Kardaras, an expert in addiction, explains brain imaging reveals what psychologists have long suspected – “Screen addiction looks like drug addiction in the brain.” Referencing study after study, he demonstrates how video games are essentially “digital drugs” because, like other stimulants, they increase dopamine levels in children’s brains, making it difficult for kids to say no. Like the disturbing “Don’t text while driving” commercials airing these days, Glow Kids includes powerful anecdotes from Dr. Kardaras’s experiences with screen addicted adolescents. Kardaras quotes Dr. Gary Slutkin, who “views the spread of real-life violence as being analogous to an infectious disease – and violent video gaming as a risk factor in contracting that disease.” In chapter after chapter, Glow Kids raises more red flags than I can mention in this review, but the data on topics like mean girls and depression makes his claims difficult to dispute. Whether addressing new clinical disorders, such as Electronic Screen Syndrome or Distracted Parent Syndrome, through this book, Kardaras presents a compelling argument that screens are hurting our children on many levels. When you consider that the Kaiser Foundation reported in 2010 that kids were spending 7.5 hours a day in front of a screen, is it any wonder that more and more children struggle to attend to what some might define as blaze real life? Over the last 30 years, Kardaras reports, there has been an 800 percent increase in ADHD. 800 percent! Ultimately, Kardaras recognizes we live in an e-world and children have to learn to get along in it. However, Kardaras explains that the part of the brain that controls impulses is “under construction” until a person’s early twenties. This is why it’s imperative that parents set limits when it comes to screens. So if you’re interested in combating what Kardaras considers technology’s erosion of a healthy, balanced, childhood, check out Glow Kids. It’ll inspire you to refocus your kids world on what really matters: relationships with real people. Want to raise a reader? 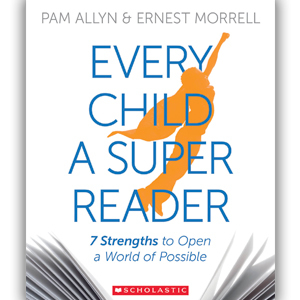 This month, I decided to review Every Child a Super Reader by Pam Allyn and Ernest Morrell in the hopes of keeping my kids’ positive summer reading experiences alive throughout the school year. According to the authors, immersing children in a literature-rich community results in critical yet passionate readers. Centered on seven strengths, this book offers explanations why “super reading” translates into high achievement but how it builds empathy, too. Allyn and Morrell explain, “Children need to be taught why it’s important to read and have clear reasons to read – if they are going to learn how to read well.” They believe this purpose has gotten lost in most classrooms. Therefore, they developed the “super reader” model. What is a “super reader”? According to Allyn and Morrell, it’s a “child who enters a text with purpose. Regardless of platform (print or digital) and genre (fiction, informational, or poetry), she reads that text with deep comprehension and finishes it feeling satisfied, informed, and inspired.” As the authors remind us, words are central to our world, which is why it’s important children learn to live among them. Contrary to what many people believe, “Reading is not solitary,” argue Allyn and Morrell. Super readers understand that speaking and listening play an important role when constructing the meaning of a story. The more readers share the more they are likely to gain from the reading experience. My kids and I not only enjoy talking about books over dinner but also recommending titles to each other on Goodreads. Taking our passion for reading online enabled us to stay engaged, since there’s always another exciting title on our “to-read” list to tackle. “Reading is like breathing in and writing is like breathing out,” claim Allyn and Morrell. This is not only a beautiful image but an accurate one. Once children recognize the connection between these processes they are better able to read like a writer – noticing how the text is constructed – and then write like a reader – anticipating the audience’s needs. For years, I’ve been organizing a book club for elementary school students at our local library. This year, my fifth grader asked if we could turn it into a Writing Club since she has so many ideas for new stories. This is exactly the kind of the natural progression Allyn and Morrel write reading encourages. “Read aloud, read aloud, read aloud,” maintain Allyn and Morrell. Many parents mistakenly stop reading to their children once they can read to themselves, but as Allyn and Morrell explain, reading aloud exposes children to more difficult vocabulary and story lines than they can read on their own. If you want your child to be a super reader, then you need to be sure they are exposed to a variety of genres on different reading levels. I find my children gravitate to their favorites – my older daughter (14) to realistic fiction and my younger daughter (10) to fantasy. When I read to them before bed, I tend to read historical fiction, like this month’s The Evolution of Calpurnia Tate by Jacqueline Kelly, so we can discuss topics they might not encounter on their own. Every Child a Super Reader: 7 Strengths to Open a World of Possible offers parents book suggestions as well as family guides with a host of ideas to reinforce the strengths super readers engage in: belonging, curiosity, friendship, kindness, confidence, courage, and hope. So if you’re interested in learning more about raising a reader, check out this great resource. Sick of selfies? I am. 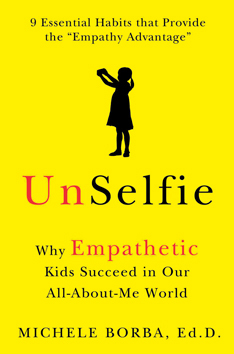 That’s why this month I decided to review UnSelfie by Michele Borba, Ed.D.. An educational psychologist, she argues it’s empathetic kids who will succeed in our all-about-me world. In UnSelfie, Borba provides a reader-friendly framework for parents that demonstrates how to shift the focus from me to we. Luckily, after Borba builds a persuasive case that our children lose out by leading less empathetic lives, she provides lots of thoughtful suggestions for improving children’s moral identity. For example, I loved how she pointed out the problem with parents snapping too many pictures of kids’ “academic successes, athletic prowess, or cute looks.” It sends the message that these are the things we value. Instead, Borba suggests parents capture caring moments, too, so kids know they matter. Borba also encourages parents to use books to help children understand the needs of others. When my kids were little, I read aloud some of the favorites she mentioned, like Paper Bag Princess by Robert Munsch. Now, I read aloud chapter books they might not otherwise pick up, like Turtle in Paradise. While most parents say they value reading, the majority stop reading aloud to their kids as soon as they can read to themselves. This not only has implications for young reader academically, but it also fails to capitalize on the belief that reading makes kids kinder. According to Borba, “Today’s kids are growing up in a hyper-connected world and admit they’d rather text than talk. But empathy is driven by face-to-face connection.” Although we implemented the “What was one kind thing you did today?” question into our evening conversations, the reality is it’s going to take a whole lot more than a shared family dinner to help my children learn how to navigate relationships. So I’ll be using this great book to help me combat the Selfie Syndrome. If you’re also interested in planting the seeds of empathy, check out UnSelfie: Why Empathetic Kids Succeed in Our All-About-Me World by Michelle Borba. It’s no surprise that children are spending more time than ever in front of screens. Why does it matter? According to pediatric occupational therapist Angela J. Hanscom, this trend means “more and more children are having difficulty with poor attention skills controlling emotions, balance, decreased strength and endurance, increased aggression, and weakened immune systems.” While Hanscom recognizes nutrition and exercise are two factors, in Balanced and Barefoot, she argues limited time independently playing outdoors is negatively impacting children’s development. Hanscom begins her book with questions I regularly hear parents asking: Why can’t my child sit still? Why does my child have an endless cold? Why doesn’t my child like to play? Then, Hanscom methodically addresses parents’ concerns to prove unrestricted outdoor play makes for strong, confident, and capable children. Her argument is so persuasive I started recommending this book to friends before I even finished reading it. According to Hanscom, research indicates the “amount of time children spend in unstructured play has decreased by 50 percent.” As a result, many children don’t meet Hanscom’s movement recommendations. She maintains children under two years of age should move for four hours daily while older children should participate in three hours of rigorous physical activities. This will not only “keep gross motor skills in optimal condition” but will positively impact your child in a variety of ways. I have reviewed 74 titles since Parenting by the Book began and this is the first one to explain the importance of the development of the vestibular sense, also known as our balance sense. Hanscom believes it is the most powerful one because it ensures “attention, balance, eye control, postural strength and more.” It’s best activated by spinning, which is why the extinction of merry-go-rounds is particularly meaningful. Contrary to today’s “sit still” approach to education, children learn best when movement is a consistent part of their day. Hanscom explains one of the reasons why children fidget in class is because moving back and forth in their chairs enables them to activate their vestibular sense. According to Hanscom, they are “straining all of their resources in order to listen and learn.” The solution? Regular, active free play outdoors. Hanscom does a great job of explaining why organized sports and adult-structured activities aren’t sufficient. Essentially, they don’t ignite the imagination. She explains true free play must be “motivated by means more than ends.” This is why, Hanscom explains, when children are having fun playing they don’t want it to end. “Play allows children opportunities to get creative, to practice regulating emotions, to enhance social development, and even to learn about themselves in the process,” Hanscom maintains. Why outdoors? According to Hanscom, man-made environments, like movie theaters and colorful indoor play spaces, overpower children’s senses. Stimuli in nature tend to be more gentle, she explains. In addition to nature being a calming force, Hanscom also believes it promotes positive sensory integration, which leads to optimal brain and body performance. And outdoor play, particularly, improves eye function. This is something Hanscom thinks more and more parents should be concerned about since excessive screen time often leads to vision problems. Like many parents, I’m worried about my kids spending too much time indoors. I read about Balanced and Barefoot while doing research on the importance of “Rescuing Recess” for this month’s issue of Richmond Family Magazine. Hanscom, the founder of TimberNook, which is an award-winning developmental and nature based program, writes convincingly on this issue as well. It has been my experience with parenting titles that they either present exhaustive research without practical suggestions or they recommend strategies without significant credible proof. 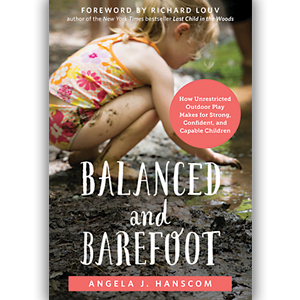 Hanscom offers readers the perfect blend of both, which is why I will be suggesting Balanced and Barefoot every chance I get. Trying to raise a joyful child in a stressful world? This month, I decided to review The Happy Kid Handbook by Katie Hurley because I liked the idea that focusing on the individual child, as opposed to following popular trends, led to a happy kid. Using numerous anecdotes, Hurley, a child psychotherapist, provides a back-to-basics guide to parenting with strategies for practicing empathy, building assertiveness, and embracing differences. Hurley argues when the word parent shifted from a noun, something one is, to a verb, something one does, it led to information overload. She references current theories – such as attachment parenting, free-range parenting, and mindful parenting – and explains parents have become so caught up in these methods they have lost sight of the child in front of them. The path to a happy kid is as individualized as the child herself. Therefore, Hurley strives to help parents know their child and make decisions accordingly. I could relate to this approach because since I started Parenting by the Book in 2010 I’ve reviewed nearly 70 titles. While they have many suggestions in common – limit screen time, encourage free play, and set boundaries – each has also offered some unique insights. As a result, I’ve never identified with one parenting style or recommended one specific book. Instead, when pressed, I tend to list my favorites and explain the strengths of each. The Happy Kid Handbook begins by explaining the importance of knowing your child’s strengths. This is not so parents can focus on them exclusively but so they can better understand how to meet their needs. If you have more than one child, you know first-hand that no two children are alike. Still, many parents treat their children the same in an effort to be fair. Hurley gives tips to understanding different personalities, like how to teach flexibility and how to prevent emotional overload. Next, Hurley argues the power of play. She explains, “A misconception about ‘creativity’ is that it is restricted to the arts. If a child is more puzzle-oriented then painting-oriented, that child might be viewed as lacking creativity.” But it’s just not true. Hurley believes creativity is about making new things by tapping into the imagination. This is something play perpetuates, along with connectedness and concern for others. Hurley is quick to clarify that she is not talking about play groups. She believes their directed manner leads to learned helplessness and puts parents on a path of constantly enrolling children in ‘age-appropriate’ classes. What kids really need is sufficient unscheduled time for play. Hurley believes one of the biggest obstacles to making this happen is the modern parents’ insecurity when it comes to structure. “Filling the downtime with more activities might make it easier for a stressed-out parent (no worries about how to pass the time), but it robs children of time to play, learn on their own terms, and create,” Hurley argues. 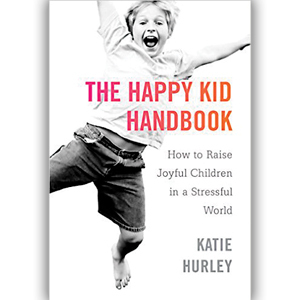 So if you think parenting advice has gotten too complicated, then check out The Happy Kid Handbook by Katie Hurley for suggestions on how to be joyful in a stressed out world. If today’s helicopter parents make your head spin, you’re not alone. 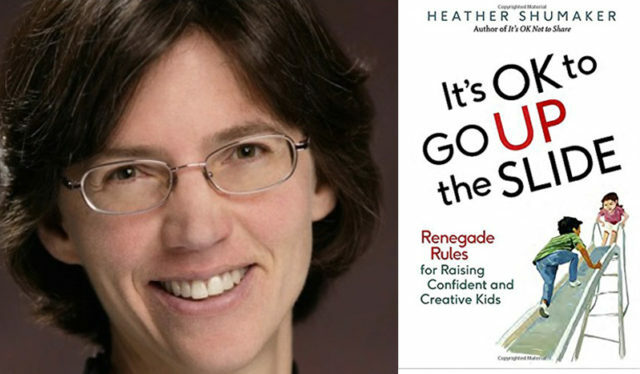 I decided to read It’s OK to Go Up the Slide by Heather Shumaker, a journalist and author of It’s Ok Not to Share, because it offered additional insights into issues like homework and after-school schedules – two topics I feel strongly about. But I ended up being most pleased with her persuasive argument for more recess; for I learned early on in my public school teaching days, increased recess meant increased productivity in class. Shumaker starts her book by reminding parents to take off their adult lenses and welcome risk. She argues, “We equate risk with danger. But risk is not a bad word. Healthy risk should be our ally; it helps our kids and lets them develop into competent, confident people.” She recognizes that this can be challenging idea for today’s parents. Sometimes, Schumaker admits, “We’re not in the mood for another spill, mess, or tear-filled scene that could result from kids making mistakes and assessing the risk on their own.” But the sooner we accept risk is a part of life, the sooner we can stop paralyzing our kids with our fears, Schumaker claims. Finally, my favorite chapter is “Recess Is a Right.” Using research on recess from a variety of sources, Schumaker builds a convincing case that “recess is as essential as lunch to the school day.” She explains the benefits of brain breaks and negative consequences of losing recess as punishment. Schumaker provides the recess guidelines by Olga Jarrett, a professor and researcher of recess at Georgia State University, which I suspect will have most RVA parents advocating for more recess at their kids schools. My fourth grader’s school falls in the “losing learning potential” category because she gets only 15 minutes of recess each day. 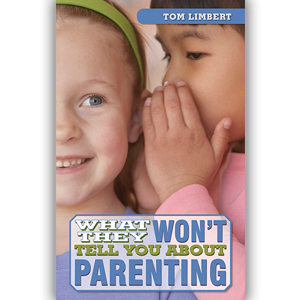 Luckily, the book includes advice for parents eager to bring about a change. In summer, playground slides get hot. They burn your legs as you slide down. If you’re looking for another way, then check out It’s Ok to Go Up the Slide by Heather Schumaker. Over the course of the book, Schumaker tackles tough issues, like why it’s so important to foster independence, assume all is well, and shield kids from fear, not the world. While it will take more than going up the slide to raise confident and creative kids, it’s a great first step. Can parents be overly attentive to their kids? This month, I decided to review The Gift of Failure by Jessica Lahey to find out. This teacher, journalist, and parent addresses the pitfalls of being too responsive to your children. According to Lahey, without a chance to learn from failures, kids miss out on the opportunities to figure out how to solve their problems. The reality is that our children are counting on us to teach them the ways of the world. Lahey believes, “If we lavish praise for inherent qualities in an attempt to bolster their self-esteem, we do them a huge disservice.” Lahey explains the dangers of a fixed mindset and the belief that children succeed because they are smart and not because they worked hard. When in truth, it’s the kids who have developed problem-solving skills from real-life obstacles who learn the value of not giving up. In The Gift of Failure, Lahey examines the downside of competitive sports and offers strategies for negotiating the transitions of middle school. She includes a host of informative anecdotes as well as practical strategies. Whether you need help establishing nonnegotiable expectations with tasks like homework or want assistance with guiding your child’s time-management, Lahey’s insights into organization are wonderful. 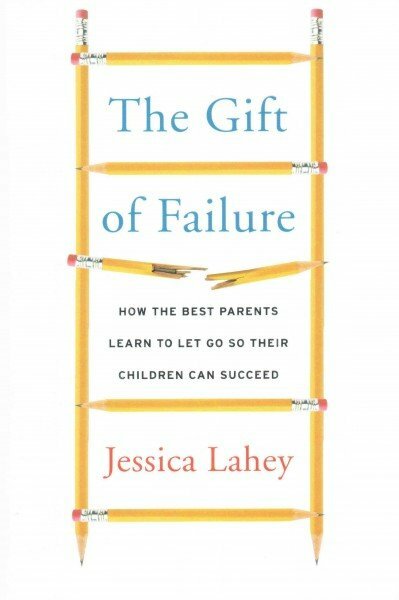 So if you’re struggling with loosening the reins, check out The Gift of Failure by Jessica Lahey for a better understanding of how the best parents learn to let go so their children can succeed. As an English professor for the Virginia Community College System, I deal with the issues confronting higher education on a daily basis. However, having a daughter in eighth grade has given me new insights into the insanity that is now college admissions process. Therefore, I was eager to read Frank Bruni’s book, Where You Go Is Not Who You’ll Be. Bruni explains, “College is a singular opportunity to rummage through and luxuriate in ideas, to give your brain a vigorous workout and your soul a thorough investigation, to realize how very large the world is and to contemplate your desired place in it. And this is being lost in the admissions mania.” Unfortunately, while I share Bruni’s view of the college experience, many don’t, and I worry that what’s being lost by this new mindsight costs far more than the exorbitant price tag. A record number of applications are being submitted by prospective students, thanks to convenient technology like the Common Application. Bruni notes, “A quarter century ago, only one in ten college-bound students applied to seven or more colleges. Now, more than one in four do.” This shift impacts a college’s perceived worth because selectivity is a factor when colleges are ranked. Bruni explains a lot – from how foreign applicants, whose affluent families can pay the bill, to “primary legacies” influence admissions. If you’re interested in learning more about the negatives of the U.S. News & World Report Rankings, this is a good resource. According to Bruni, “Roughly 75 percent of the students at the two hundred most highly rated colleges come from families in the top quartile of income in the United States.” He explains this is in part because of families’ investment in the process. Bruni references Mark Sklarow, the chief executive of the Independent Education Consultants Association, who said over a decade ago approximately 1,500 professionals worked as full-time college consultants and by 2014 there were about 7,500. Still, Bruni gives many effective examples to illustrate his point that it’s what you put in to college, not where you go, but I particularly liked this quote from makeup mogul, Bobbi Brown, who switched colleges three times, “If you can identify and stick with something you’re genuinely passionate about, you’re ahead of the game,” regardless of where you go to school. When I speak to my college classes about this issue, I compare it to Weight Watchers. Just because someone pays to join and attends meetings, that doesn’t mean he or she is going to lose weight. Results are determined by the person’s commitment every day. 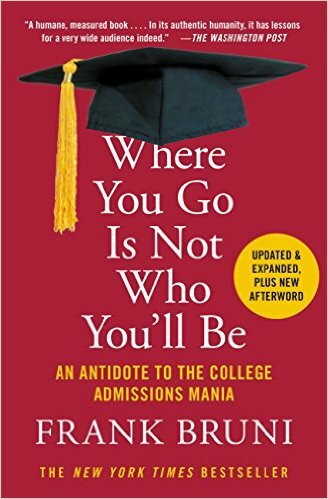 So check out Frank Bruni’s antidote to the college admissions mania. He paints a convincing picture that hard work, and what my family refers to as “chutzpah,” is what’s required to succeed, not the name of the degree.